The name Situational Leadership® has been extended variously by Hersey and Blanchard to related business services and products. Generally when referring to the concept it is safer and correct to show the name as a registered protected trademark: Situational Leadership®. Focuses on followers, rather than wider workplace circumstances. Asserts that leaders should change their behaviour according to the type of followers. Proposes a 'continuum' or progression of leadership adaptation in response to the development of followers. Note: It is important to consider that groups and individuals may require different approaches when using Hersey and Blanchard's model. Notably, where members of a group possess different levels of capability and experience, Hersey and Blanchard's model requires a more individualistic approach, rather than a broad group approach. Accordingly, this summary refers mainly to 'follower' or 'followers', rather than a 'group', in explaining how the model is best appreciated and used. The term 'follower' may be interpreted to apply to an entire group for situations in which members possess similar levels of capability and experience. Extending the logic of this, Hersey and Blanchard further described and presented these four follower 'situations' as requiring relatively high or low leadership emphasis on the Task and the Relationship. For example, a high task emphasis equates to giving very clear guidance to followers as to aims and methods. A low task emphasis equates to giving followers freedom in deciding methods and perhaps even aims. A high Relationship emphasis equates to working closely and sensitively with followers. A low Relationship emphasis equates to detachment or remoteness, and either a trust in people's emotional robustness, or a disregard for emotional reactions. This 'low relationship' aspect is also called 'separated'. High Task means followers have Low Ability. Low Task means followers have High Ability. High Relationship means followers are Willing. Low Relationship means followers are Unwilling. 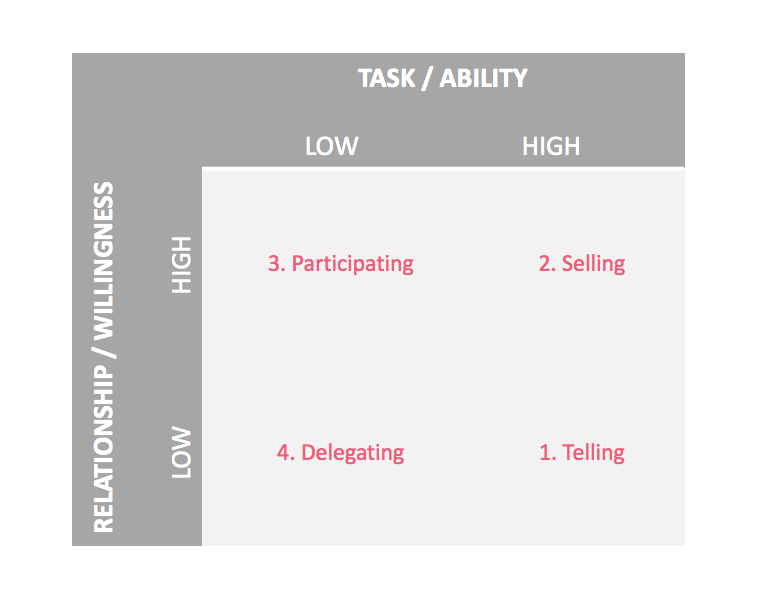 The high/low Task/Relationship dimensions feature strongly in the diagrams and applications that Hersey and Blanchard developed around the Situational Leadership® theory. The logic can be represented helpfully as a simple practical concise 'leadership styles guide', as below, including the continuum, by which the leader changes styles in response to the growing/different maturity of followers. Given the name of the Situational Leadership® theory, it's useful to note that Hersey and Blanchard used the word 'situational' chiefly to suggest adaptability, more than the situation in which people operate. In fact, Situational Leadership® focuses firmly on the follower(s), rather than the wider situation and workplace circumstances, and the model particularly asserts that a group's performance depends mostly on how followers respond to the leader. The model also proposes a 'continuum' or progression of leadership adaptation in response to the typical development of followers. See the M1-M4 continuum on the grid above. Hersey and Blanchard used the word 'maturity' in referring to the continuum of follower development, requiring and enabling a leader to change leadership style through the stages outlined above. Here 'maturity' entails experience, skills, confidence, commitment, etc - a combination of the two main 'follower' criteria, namely Ability and Willingness (Competence and Confidence/Commitment), which we can also interpret to be the follower's ability to self-manage or self-lead. Hersey and Blanchard clearly mapped a progression of changing leadership styles in response to the tendency for people's maturity to increase over time. This aspect aligns somewhat with the Tannenbaum and Schmidt Continuum model, specifically limited to where both models can apply to group maturity/capability development. That is, under certain circumstances, a leader adapts his/her behaviour progressively, in response to followers' growing maturity/capability, usually over many months, potentially from the inception or inheritance of a new team, ultimately to when the team can self-manage, perhaps even (and some would say ideally) to be led by a new leader who has emerged from the team to succeed the departing leader. N.B. This is not to diminish the multi-faceted nature of the Tannenbaum and Schmidt and Situational Leadership® models, nor to overstate an overlap between them. Both models offer quite different frameworks for adapting leadership behaviour, based on more complex factors than simply the development of group maturity. Incidentally, from a group standpoint rather than a leadership angle, Bruce Tuckman's 'Forming-Storming-Norming-Performing' model is a very helpful separate reference concept for exploring and understanding group maturity development. Follower lacks experience or skill, and confidence to do the task, and may also lack willingness. Telling - Leader gives precise firm instructions and deadlines and closely monitors progress. Follower lacks the ability, perhaps due to lack of experience, but is enthusiastic for the work. Selling - Leader explains goals, tasks, methods and reasons, and remains available to give support. Follower is capable and experienced, but lacks confidence or commitment and may question the goal or task. Participating - Leader works with follower(s), involved with group, seeks input and encourages efforts. Follower is capable, experienced, confident and committed to the goals. Delegating - Leader gives responsibility to followers for setting goals, planning and execution. Identify the category of follower(s). Adapt leadership style/behaviour to match. Continue to gauge follower status (notably ability and willingness) and adapt leadership behaviour accordingly. The Situational Leadership® model is widely taught and highly regarded. It is easier to apply for individual followers than for a group, notably where a group has mixed levels of abilities and willingness. The model also requires a leader to be capable of adapting or changing leadership behaviour, which not all leaders find easy, and some find impossible if the leader's own underlying beliefs cannot be modified. N.B. As indicated already, Situational Leadership® has been extended variously to related business services and products. Generally, when referring to the concept it is safer and correct to show the name as a registered protected trademark: Situational Leadership®. Use of material relating to Situational Leadership® and/or Situational Leadership II® - especially in commercial training - requires licence and agreement from the respective companies: Situational Leadership® is a trademark of the of the Centre for Leadership Studies, who represent the interests and products of Dr Paul Hersey. Ken Blanchard (incidentally, author of 'The One Minute Manager') went on to develop Situational Leadership II®, which now covers a range of products marketed by The Ken Blanchard Companies.